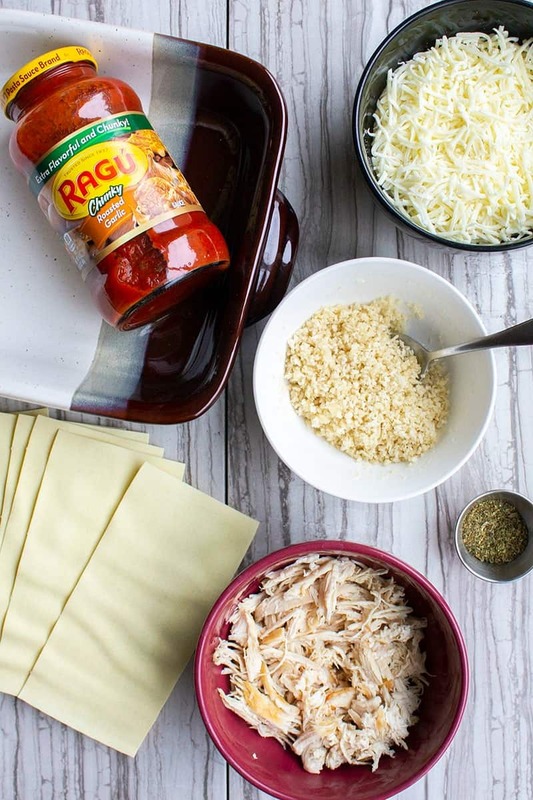 Chicken Parmesan Lasagna is an easy weeknight mash-up of two of our favorite dinners! 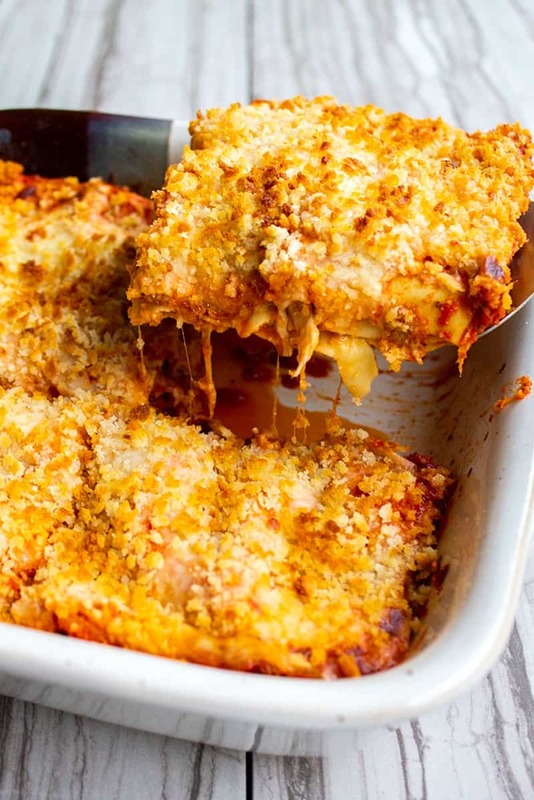 It’s a little lighter than a traditional lasagna and doesn’t take half the dishes of chicken Parmesan! Chicken Parmesan is a staple in our menu. It’s the dish that landed my husband and I’ve been making it for us ever since. My other go-to Italian dish is my Mom’s Lasagna. While I adore both of these dinners, they’re both a labor of love and the clean up is not my favorite. 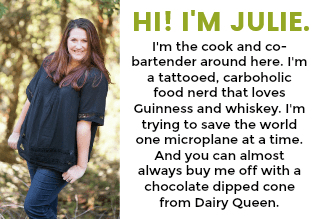 So I decided to make a dinner mash-up and turn our two favorite recipes into an easy weeknight meal, with next to no clean up! 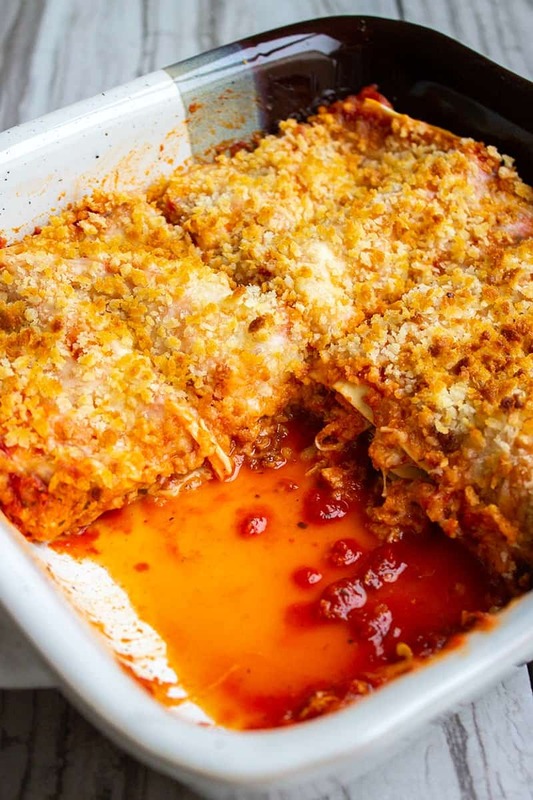 Behold our new favorite Italian dinner, Chicken Parmesan Lasagna!! For Christmas Eve we always do a big family potluck, everyone brings a dish or two and we go to town. More often than not we do a Mexican or Italian food theme. I’m talking enchiladas or lasagna and 7-layer dip or antipasto. SO good! Italian family meals are something we love for any occasion. I mean when your Brother-in-law’s name is Marcello and his kids are Sophia, Enzo, and Bianca…there has to be some good Italian food hanging around the table. Since I’m wasn’t raised by an Italian grandma to teach me all about a family sauce recipe, my grandma was Southern and that’s a whole other world of deliciousness, I grabbed a jar pasta sauce from the store for this dish. I crush really hard on roasted garlic so it’s my default choice when there’s a roasted garlic pasta sauce. Oh! And choosing a sauce with lots of basil is always a good idea. I did add extra dried basil and oregano to my lasagna. You don’t have to do that. I can never get enough of either herb so I made this pasta the way I like. If you want to add some more color to the dish, presentation points and all, you can sprinkle some fresh basil on top too! One of my favorite things about this lasagna is that it is lighter than your average lasagna. I’m not saying I cut all the calories out or anything, but Mike isn’t the biggest fan of ricotta. (That’s fine, more for me!!) I completely left out the ricotta layer for him and went with a Chicken Parmesan focused ingredient list. When you eat this dinner it doesn’t have that super-rich, heavy feel to it. Don’t get me wrong, I LOVE that richness, but this is a nice change. It threw Mike off at first, but he totally dug it. Next time I think I’ll add the ricotta back in, just to change things up. But this lasagna is great either way you choose to make it! 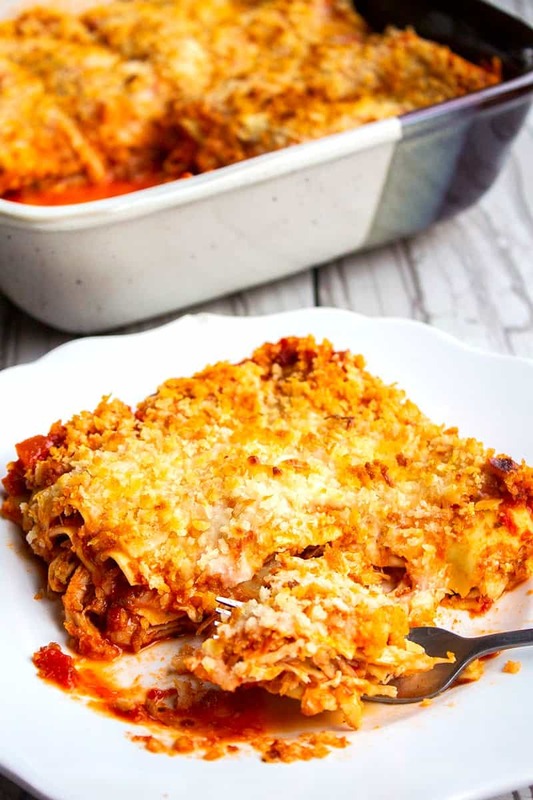 Chicken Parmesan Lasagna is an easy weeknight mash-up of two of our favorite dinners! It's a little lighter than a traditional lasagna and doesn't take half the dishes of chicken Parmesan! Pour about 1/4 cup pasta sauce into the bottom of a 9-inch x 9-inch baking dish. Spread out the sauce so it covers the entire bottom of the dish. Layer lasagna noodles over the bottom of the dish so the sauce is covered. Spread half of the chicken over of the noodles. Sprinkle half of the basil and oregano over the chicken. Cover the chicken evenly with 1/3 of the cheese. Spread 3/4 cup of sauce over the cheese, and top with noodles. Repeat layering chicken, herbs, cheese, and sauce. Top with noodles one more time, covering the second layer. Spoon some more pasta sauce over the top noodles and spread to make sure all of the pasta is well coated. Sprinkle the remaining 1/3 of the cheese over the sauce. In a microwave-safe bowl, melt the butter. Add in the breadcrumbs and stir until the breadcrumbs are evenly moistened. Cover the baking dish loosely with foil and bake for 25 minutes. Remove the foil and turn your oven to broil on HIGH. Keep a close eye on the dish so it doesn't burn, and cook the top of the lasagna until the breadcrumbs are golden brown. Remove from the oven and let sit for a few minutes before serving. Garnish with fresh basil, if desired. 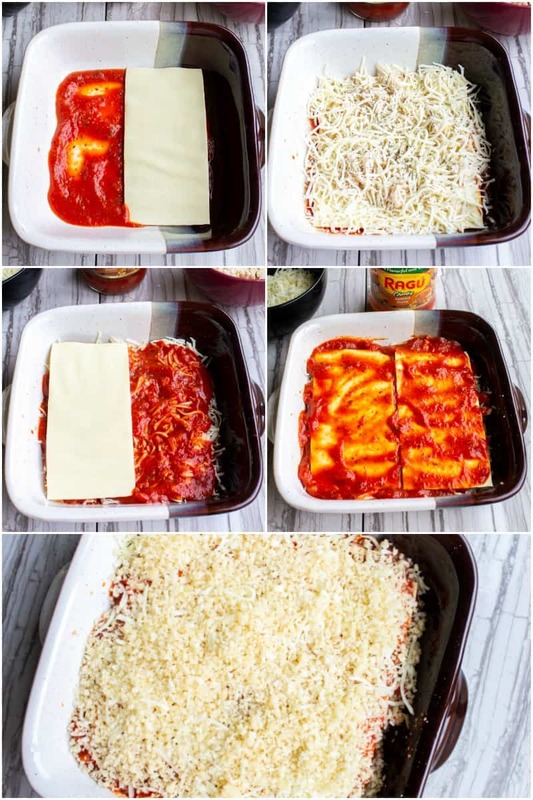 If you prefer to use regular lasagna noodles, cook them according to package directions and cut to fit your pan. You can use a rotisserie chicken from the store to cut down on prep time. You can easily double this recipe and make it in a 9-inch x 13-inch baking dish. The cooking time will remain the same.